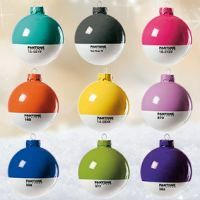 Why not add a dash of designer chic to your decorations with our original Pantone Christmas Baubles. Each painted glass baubles features an official Pantone colour and the reference code to match! Created by Italian design house Seletti and available individually, or as a set of 9 different colours, these Pantone Christmas Baubles are sure to delight and amuse anyone with a background in design. And create feelings of bafflement in anyone else!